Remember me? I’m the one that used to have time to knit and used to have time to blog. Once upon a time, there were new things to read here more than once a week or so. My childhood, for the most part, was a reasonably happy one. The Plan B class has been taken several times and passed several times and the best results handed in. Ahem. Other yearly stuff that means nothing here is now wrapped up and in the hopper, and I should be back to just the normal level of madness. And I have been knitting. Look! 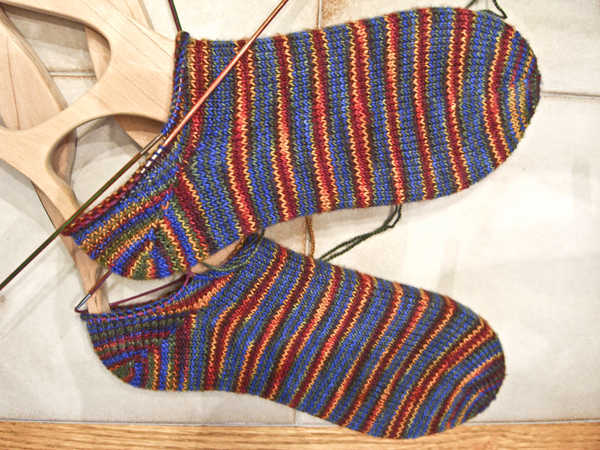 I’ve turned the heels on the Clown Barf (note to self: find a better name for these) stripy socks. And I’d like to talk a little bit about colors. Yes, I know the title says this is going to be about heels. Hang with me, gentle reader, and we’ll get there. I don’t hate these socks. In fact, as they’re knitting up I think they look just fine. I’m not going to wax rhapsodic over their delights. But they’re OK and I think the intended recipient will like them well enough. But here’s the thing. I just had to add this yarn to my collection because, in the skein, the colors were so gorgeous and vibrant that it just jumped out at me. Even in the ball, the colors are lovely. But knitted up? Not so much. The colors combined in the stripes in such a way that they look… muddy. The gorgeous brightness is totally lost. But look at the heels! Here. We’ll take a closer look. Pop up both of the pictures so you can really see the difference. Go head. I’ll wait right here. On the heels, you can see why I fell in love with this yarn. With each color spanning multiple rows, the intense little hits of color really pop. I want the rest of the socks to look like the heels. I’m resigned. I know it won’t happen. But for the other skein that I have (slightly different colorway but still bright), I’m thinking… entrelac. I do appreciate all of the suggestions for how to fix the color. I think with entrelac, even if the colors shift in the middle of a diamond, those hits of color will really show up. But we’re talking about color and I really meant to talk about heels. Nice heels, eh? I’m quite taken with how they look. I should be. I knit the $#@% heels 3 times. I go through the same process every time I knit short row heels. I say to myself, Self, you are, in some ways, an experienced knitter. At times you are even an advanced knitter. You can conquer that pesky wrap-and-turn! Go for it! 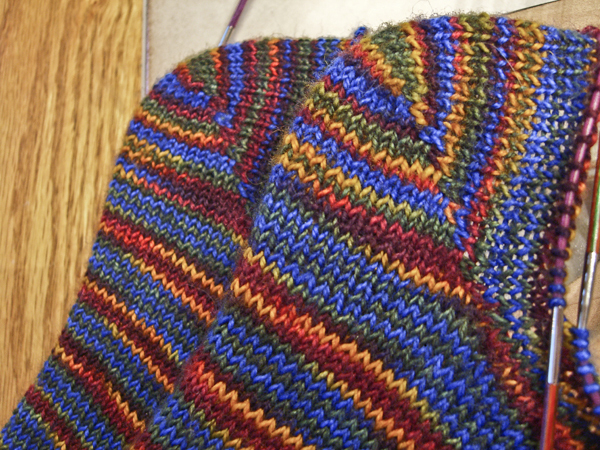 I then proceed to knit standard short row heels with wraps and turns. And I get holes. And the heels gets bumpy and icky inside. And there are little hard bits. And sometimes the wraps show. And there are holes. I’ve tried multiple ways of doing the wrap. Regular wraps. And YO wraps. And even Japanese short-rows which leave the wrap unwrapped until it’s picked up. It doesn’t matter. I get holes and icky hard bits, etc. Eventually I give up, because despite evidence to the contrary I can be taught, and I do Sherman heels. And they always look lovely. And I wonder why I keep putting myself through such grief. Are there any knitting techniques that you just can’t seem to master?